They say no good deed goes unpunished. GRETA, coming to AMC® on March 1, takes that idea to a horrifying extreme. A young woman finds a purse on the New York City Subway and returns it to the owner. That’s her introduction to Greta, a nice but reclusive spinster. What begins as a nice gesture blossoms into a friendship — until Greta’s true nature is revealed to be something dark and twisted. Here’s the inside scoop on Neil Jordan’s psychological thriller. Frances McCullen (Chloë Grace Moretz) lives a pretty routine life. She misses her late mother dearly and has moved to New York with her best friend. She’s still struggling, though, especially with making friends. Then, she finds a handbag on the subway. The owner is Greta Hideg (Isabelle Huppert), seemingly sweet and a bit lonely. She’s not unlike Frances, in that respect. For a short time, their friendship almost feels totally effortless. No one is a better choice to play a character like Greta than Isabelle Huppert. The actress has played startling and unpredictable characters in films like THE PIANO TEACHER, I HEART HUCKABEES and ELLE. No one dances on the razor-thin line between difficult emotional states like Huppert. As Greta, she’s got a steely gaze and tight, ironic smile that makes the woman believable, complicated and frightening. We see her loneliness and her tendency toward pure evil. She’s despicable, but there’s more going on than just obsession or psychopathic behavior. Huppert’s work casts a shadow over the entire film. When Greta is on screen, she makes every situation unnerving and strange. 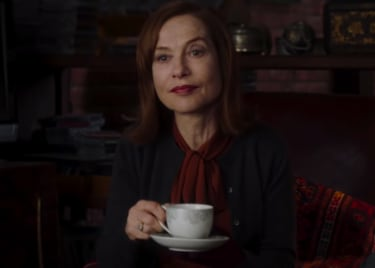 But when director Neil Jordan pushes the story into overdrive, Greta becomes a larger, darker presence that looms over every scene in the movie, even when she’s not physically present. GRETA is plausible enough to play on all of our fears about the motivations of people all around us. As adults, it can be difficult to make new friends, because we’re reluctant to entrust ourselves to other people. We don’t want to be vulnerable. We don’t want to be hurt. Frances is certainly vulnerable from the outset. Whatever Greta’s plan is, the younger woman is the perfect mark. She’s ready to open up to someone, and Greta is there to take advantage of that moment. We know enough about the real world that the older woman doesn’t seem like an unbelievable character. The most terrifying monsters aren’t necessarily supernatural. They can be seemingly regular people. Greta is calculating and extremely vindictive. Her innate understanding of psychology might be her greatest weapon; she so easily takes advantage of Frances’s need for companionship. 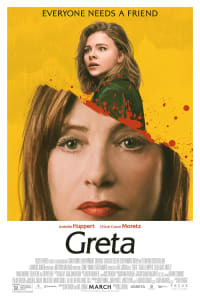 Greta is that person most of us have feared at some point: a friend who turns out to be manipulative and destructive — and unstoppable. GRETA opens in AMC theatres on March 1.